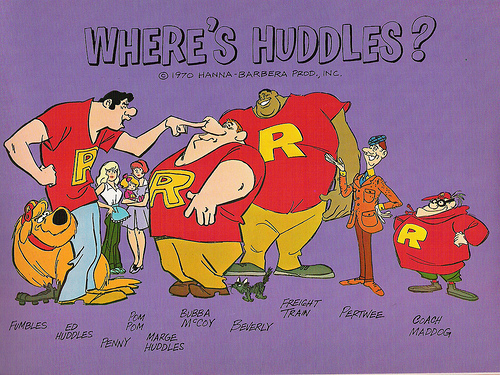 This week’s minorities in cartoons entry is “Where’s Huddles?,” a short-lived 1970 Hanna-Barbera animated series. The series was a summer replacement series that aired on CBS during the summer of 1970. “Huddles” filled in for “The Glenn Campbell Goodtime Hour,” a variety show featuring the eponymous singer. The series centered around the misadventures of Ed Huddles and Bubba McCoy. Ed and Bubba are a pair of neighbors, as well as teammates for the fictional pro football team the Rhinos (Ed’s the team’s quarterback). Ed and Bubba’s neighbor was the cranky Claude Pertwee, who was voiced by actor Paul Lynde. Other characters included: Ed and Bubba’s wives, Marge and Penny; the Huddles’ infant daughter, Pom Pom; and the Huddles’ dog, Fumbles. As the above suggests, the series had some resemblances to Hanna-Barbera’s previous primetime series “The Flintstones.” Marge was voiced by Jean Vander Pyl (Wilma’s voice), while Bubba was voiced by Mel Blanc (Barney’s voice). The series premiere focuses on Ed and Bubba getting, and then fighting over, a swimming pool—just like in one of the first “Flintstones” episodes. Of course, as pro football players, they should be financially much better off than blue-collar Fred and Barney. To nitpick things further, air conditioning had become commonplace in better-off individuals’ homes by 1970. One of the Rhinos’ teammates was an African-American player nicknamed “Freight Train.” Freight Train’s American TV’s first regularly-seen African-American animated character in primetime. Previous primetime animated fare was mostly either produced pre-“I Spy” (American TV’s first primetime drama to feature an African-American star, Bill Cosby) or centered around funny animals (such as “The Bullwinkle Show”). Freight Train was voiced by African-American actor/singer Herb Jeffries. “Where’s Huddles?” was aired for just 10 episodes. It was followed up in 1971 with an also-short-lived comic book by Gold Key. After that, it’s pretty much been largely unseen, save having appeared very sporadically on Boomerang. In 2016, “Where’s Huddles?” was finally released to DVD as a complete set through the Warner Archive service.